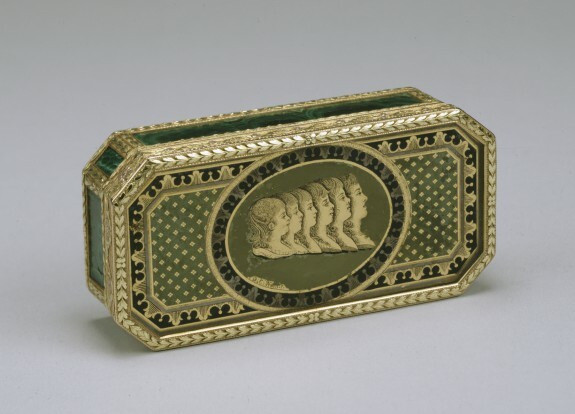 Description This rectangular tobacco box with chamfered corners is faced with sheets of malachite. Set in the lid is a panel of "verre églomisé," a decorative technique in which a design is worked onto the reverse side of a sheet of glass that has been gilded. silvered, or painted-gold and black being the most common color combinations. In Russia, it was a popular art form not only for small items, but also for large pieces of furniture. Although much "verre églomisé" was produced at the Imperial Glass Factory in St. Petersburg, individuals, including Grand Duchess Marie Fedorovna, also practiced this technique. Represented in profile are the six older children of Paul I (1754-1801) and his second wife, Marie Fedorovna (1759-1828). The portraits replicate an aquatint by James Walker (1748-1808[? ]), an English artist appointed engraver to the Court of Catherine II in 1785. His print, in turn, is based on a miniature by Marie Fedorovna dated 1790, which she presented to her husband on September 19 of that year. The subjects are Grand Dukes and Duchesses Alexander (later Alexander I), Constantine, Alexandra, Elena, Maria, and Catherine. Objects of Vertu: Precious Works of the Eighteenth Century. The Walters Art Gallery, Baltimore. 1984. The Fabergé Menagerie. The Walters Art Museum, Baltimore; Columbus Museum of Art, Columbus; Portland Art Museum, Portland. 2003-2004. Fabergé and the Russian Crafts Tradition: An Empire's Legacy . The Walters Art Museum, Baltimore. 2017-2018. Provenance Alexandre Polovtsoff (Aleksandr Aleksandrovich Polovtsov), Paris; Henry Walters, Baltimore, 1929, by purchase; Walters Art Museum, 1931, by bequest.